Known for offering great value, excellent locations and unparalleled creativity, ibis Styles Hotels has a large selection of unique accommodations for travelers located all around the world. An extension of the French AccorHotels company, ibis Styles takes you to the far reaches of the Earth in ultimate comfort. The newly renovated location in Shanghai is a stunning four-star hotel under the management of HuaZhu Hotels Group. 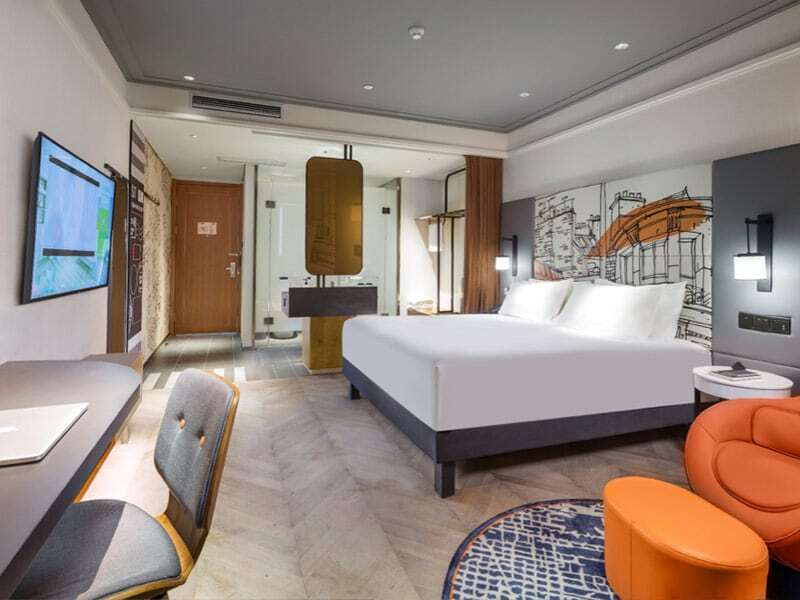 SL+A HOTELS was appointed to develop a new guestroom design standard for ibis Styles Hotels in China. The integration of modern amenities with the undeniable pop and pep of all ibis Styles properties is evident, with the ‘urban adventure’ theme tying each of the elements together. Travelling allows time for self-reflection while seeing the world. 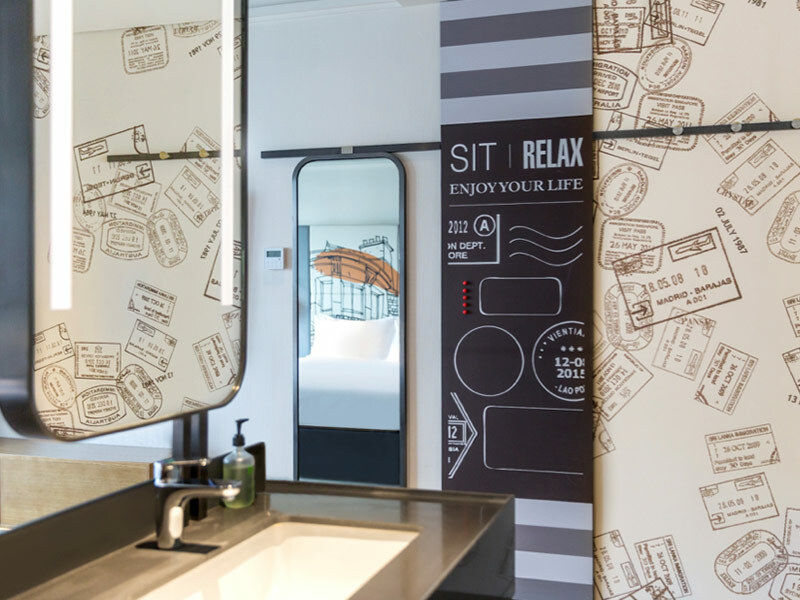 Designed as a mock-up room in the hotel, the new style concept delights travelers with small fun surprises in the room. 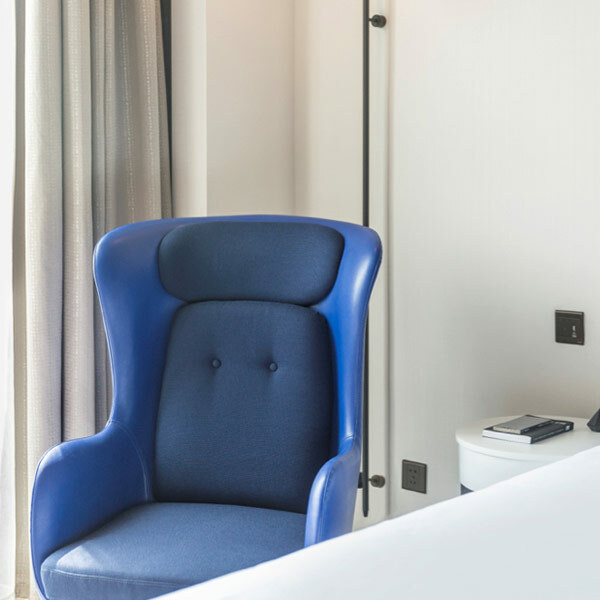 These details were dreamt up by SL+A HOTELS to conjure up an immediate connection with guests as they embark on their adventure in a new city. The theme was perfectly captured through an intensive Interior Design, FFE Design, Art & Accessory Design package, proving that the multi-disciplined team was a great choice for this project. We know that it is the journey and exploration of new places that allows us to open our mind and reconnect with our sense of self. Spatial and graphic design are joined in perfect harmony to deliver a space that tells a transformative story. Each of the 102 rooms packs a young and fashionable punch in the large, twenty-five square meter lodgings. The open layout allows the washbasin and vanity counter to be seamlessly integrated into the living space. Should guests require a separation of the sleep and ablution spaces, a soft wire mesh curtain is available to divide these areas. Our graphic designer created customs and immigration stamps hailing from different countries to be featured prominently throughout the space. Design efforts resulted in a variety of visual patterns that give off a fun and distinctive style. Unexpected touches like the inclusion of a chalkboard wall give guests the option to leave personalized chalk messages to other hotel guests, or as encouragement to management for excellent service. Stepping away from tradition, ibis Styles Shanghai is decorated with style – together with SL+A HOTELS, we have incorporated diversity and personality into a brand known for iconic addresses and properties. This is just the beginning of your introduction to the rhythm of the city. Guests can open the windows of the world through adventure, release their inhibitions, embrace their senses, record and participate fully in discovering the essence of Shanghai and all that the city has to offer.